Often, it's not necessary to reinvent the wheel to make progress. Existing technologies and processes exist because somebody, somewhere found them useful. Eventually, someone will figure out a way to make them more useful. This month's features, in one way or another, examine technologies and processes that follow those sorts of patterns. 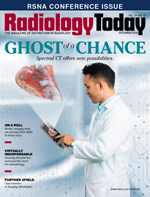 Our cover story, by Keith Loria, looks at a new twist on spectral CT. Researchers in New Zealand wondered what would happen if they added color to spectral CT images to differentiate bone, muscle, and cartilage. The result was 3D imaging that offers the possibility of one day assisting in the diagnosis of cancers and blood diseases without the need for invasive tests. Another preexisting technology that is gaining traction, pun intended, is imaging on wheels. Mobile imaging units have been around for a while, but health care providers are using them more and more to serve populations that have previously been difficult to reach. Beth W. Orenstein profiles three use cases that demonstrate the potential of these units to improve health care delivery and/or screen more effectively for cancer. Orenstein also reports on the evolution of teleradiology. Once relegated to night and weekend shifts, teleradiology is emerging as an integral part of modern radiology practice. Small and rural hospitals and group practices, especially, need more hands on deck when it comes to keeping up with the volume and complexity of today's radiology studies. And few but the largest academic centers can afford to keep every type of medical imaging specialist on staff to read the most difficult cases. Teleradiology offers flexibility to radiologists, as well. Many who are looking to scale back their duties or who simply prefer the freedom that off-site reading allows are joining the ranks of teleradiology companies. Speaking of large academic centers, although that's where you'll find the cutting edge of imaging informatics, there are many ways to extend informatics to private practice. We spoke with some experts in the field to find out how they adapted their informatics know-how from residency and fellowship to fit private practice paradigms. They also shared tips about how those who are interested in continuing their study of informatics can stay involved in this rapidly growing subspecialty. Finally, if you're at RSNA, stop by booth 3252 and say hello. We always appreciate hearing from our readers. Enjoy the show and the issue.